Easy Living W/ Quality & Classy Finishes! 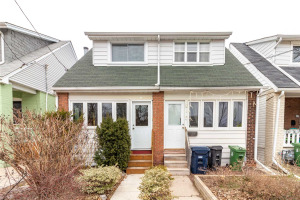 Welcome Home To Luxury Hardwood Flrng' Massive Reno'd Kitchen W/ Gorgeous Ss Double Wall Oven & Radiant In-Floor Heating, Walk-Out To Fully Fenced Private Back Garden & Pwr'd Workshop! 1+1 Parking Off Lane, Just 5 Mins To Woodbine-Danforth Ttc & Around The Corner From East Lynn Park, Farmers Market, Festivals & Splashpad! House Is Snug As A Bug W/ Energy Efficient Upgrades Inc'n Rooftop Solar H/W System..Cont'd Below! Completely Re-Insulated W/Foam, Upgraded Windows & Skylight! 2+1 Beds, 2 Baths, & Large Family/Rec Room In The Basement! Ss Refrigerator, 2 Convection Ovens, Cook Top Stove, B/I Dishwasher, Washer & Dryer.